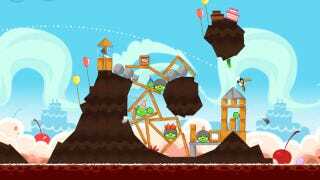 There is a legitimate, free version of Angry Birds for Android. But one app that appeared on the Android Market (now Google Play) last fall wasn't it. It was a fake, a piece of malware explicitly designed to part phone owners from their cash. Now, the scammers that took the money have been ordered to give it back. The BBC reports that a company in Latvia has been assigned stiff fines for deliberately misleading consumers with fake versions of popular mobile games like Angry Birds and Cut the Rope. To users, the fake games downloaded properly but appeared never to launch correctly after install. In reality, on launch the apps sent the user three hidden SMS messages at a cost of 5 pounds ($7.80) each. The messages were hidden in such a way that the phone user would have no idea the messages existed until receiving the bill. The firm behind the malicious apps has been issued a fine of 50,000 pounds (approximately $78,3000), plus ordered to refund bilked customers to the tune of 28,000 pounds (nearly $43,400). While Google Play does not use the same review process for software that the Apple App Store does, that hasn't stopped bogus games from appearing on iOS devices, either. As always, research and caution are a consumer's best friends. The iPhone&apos;s Pokémon is Gone. Here&apos;s How to Get Your Money Back.